Coordinates:46° 34’N. 48° 1’ETwas a mildly brisk winter’s nite when a friend an I decided to travel around Britian in search of a warm and comforting tavern. Well, ’twas not long before we decided to take a trip to the famed Green Gryphon. I had heard about this place from many people,but had never decided to go there. So without further hesitation my friend and I headed through the city to the Green Gryphon. 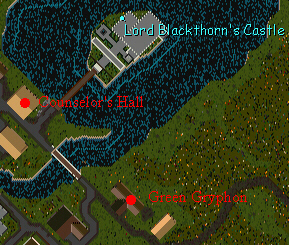 The Green Gryphon is located in Eastern Britain across from the Northern Bridge To get there from the Counselor’s Guild follow the road east. You will come to the Northern Bridge. Follow the road over the bridge. The next building to the north side of the road is the Green Gyphon. Simon’s (the owner and barkeeper of the tavern) hours are from Wednesday to Friday, from 9:00 PM PST. till 11:00 PM PST. The Green Gryphon is a very well decorated place. 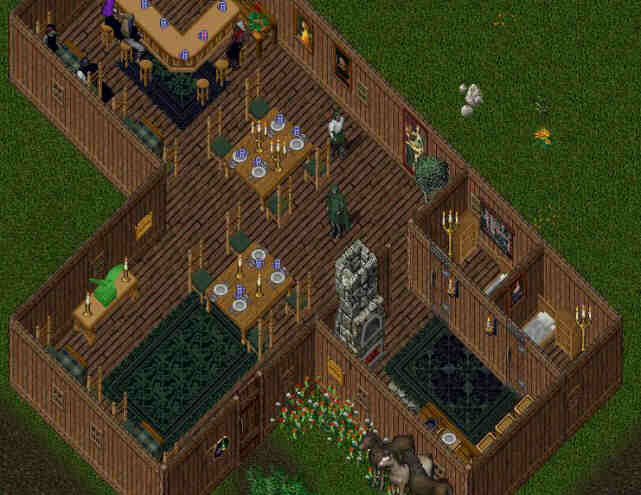 It has fine green carpets, many tables, a lovely bar and a statue of a gryphon made out of solid jade. It serves a variety of foods. Whilst I was there I had a lovely Herb Pheasant. It was quite good, and some of the best food in Britain. The drink there is extremely good, Simon seems to have every drink I can think of. His specialty is a pale wine of which he has a keg of right next to his bar. The Green Gryphon serves many things and all of them good. The tavern is a key meeting place for any guilds. It is also just a place to give thy boots a rest. All in all, tis a most wonderful tavern. Simon has done a wonderful job.